Dr. Bronner's Organic Lotion For Hands and Body are certified to National Organic Standards. 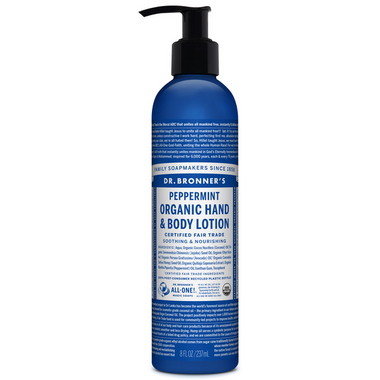 Dr. Bronner's lotions are based on pure organic oils free of petrochemically modified ingredients and preservatives. Organic jojoba oil moisturizes dry skin exceptionally well due to its unique similarity to the skin's natural oil. Organic coconut oil assists absorption while organic hemp and avocado oils help keep skin smooth and supple. Organic grain alcohol (ethanol) is used as a natural preservative at a level that helps absorption without being drying. Only the finest organic essential oils are used for fragrance. Sold in an 8 oz. bottle. I use it everyday for my face, body and hair! I love this creme! Purchased this lotion to use a a carrier base for homemade mosquito repellent. It is a bit runny but it works great for this purpose. The peppermint scent is light but does linger for a while. So disappointed with this lotion. It does smell very nice though not long lasting. The texture is a bit runny and feels a little sticky. It doesn't absorb well, instead it feels as if it evaporates. But, most importantly, it doesn't moisturize at all. Love the scent but feels a bit sticky and the scent doesn't last long. Love the scent and it absorbs quickly but not very moisturizing as I had hoped it would be. This is a great lotion! Leaves your hands minty & fresh. It is nice for hydrating. The thing I do not like is I find it makes my hands oily after which is a bit annoying as I have to be careful about what I touch. This is a sweet smelling lotion. It is not very thick which can be good depending what you like. It goes on without being greasy, and soaks in quickly, but if you are looking for serious (or even moderate) hydration, this lotion will not cut it.